Robinia viscosa.commons wikipedia.org. (Accessed 6/2014). 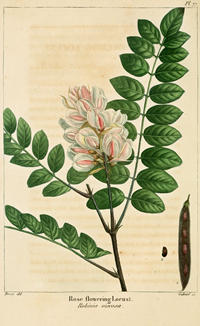 Robinia viscosa is a small tree or large shrub to 5 m, twigs sticky-glandular. Leaves alternate, pinnate, leaflets 13-25, narrowly egg-shaped to oval, stipules linear. Flowers pink to white with a yellow spot, pea-flower-shaped, 2.5 cm. Origin: Native to mountains of PA and south.